Situated in the beautiful Sultanahmet Square (Sultanahmet Meydani) about 300 meters apart the Haghia Sophia and the Blue Mosque face each other. Both structures are historical-cultural gems within Istanbul. 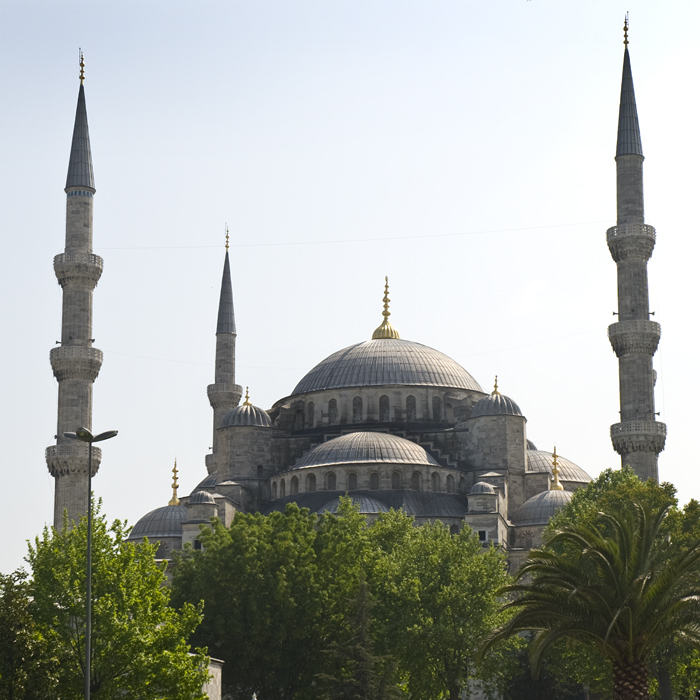 The Blue Mosque dates back to the 17th century, while the Haghia Sophia has its first construction date during the 5th century. Adjacent to these architectural wonders is the remnants of the Hippodrome, which was once a huge stadium in the heart of the Constantinople. This was originally built during the 3rd century and after Emperor Constantine enlarged it, the stadium was reported to hold up 100,000 spectators. 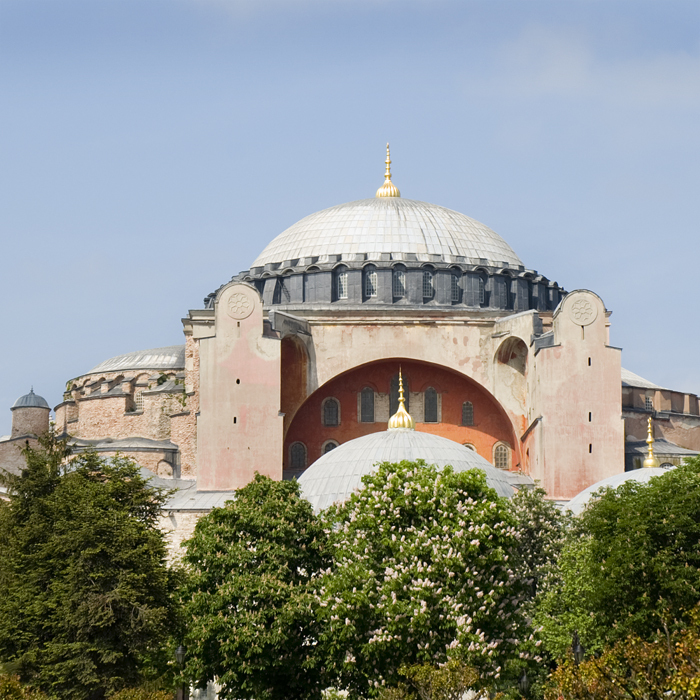 Here are a few more photos depicting various views of the Haghia Sophia and the Blue Mosque. Interior view of the nave looking up towards central dome. 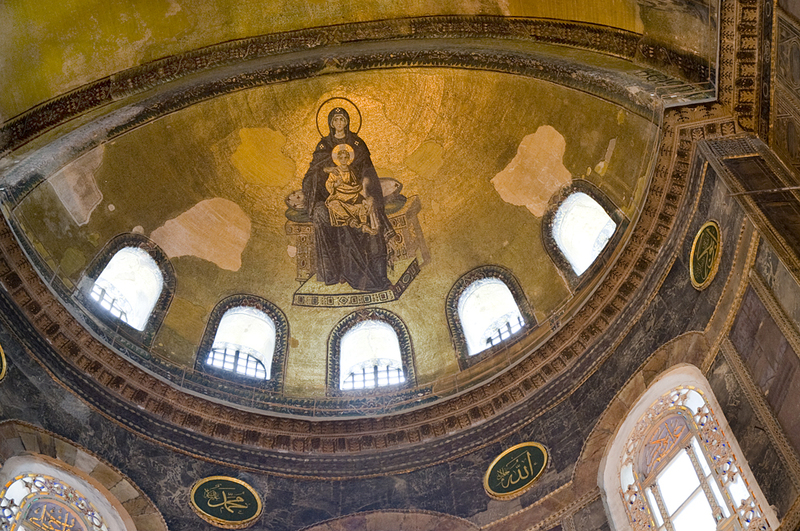 Included are mosaics of seraphims and Islamic calligraphic roundels. © 2012 Terry Ownby. 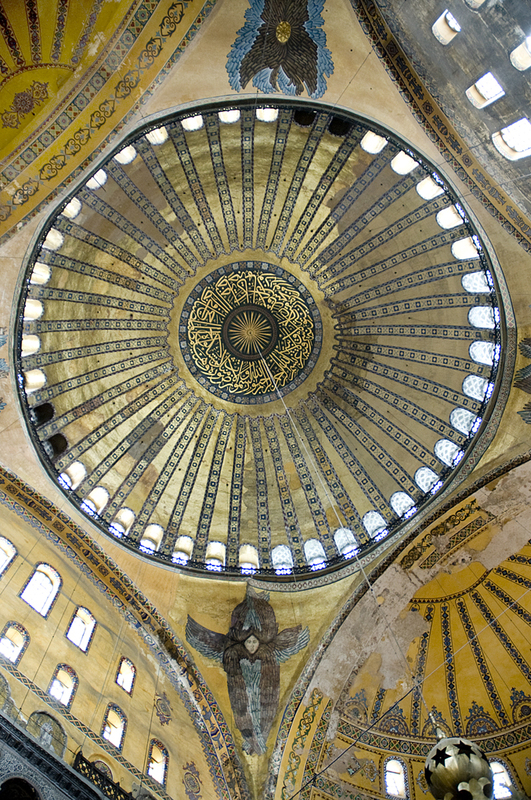 Looking up at the central dome of the Haghia Sophia (Church of Divine Wisdom). 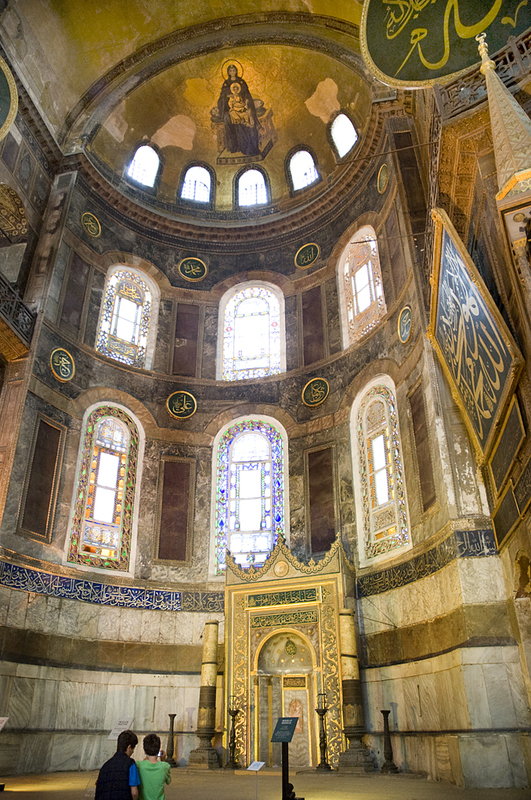 In addition to beautiful tile-work, frescoes of the “seraphim” angels can be seen along with gold Islamic calligraphy in dome center after conversion by Ottomans during 15th century. © 2012 Terry Ownby. Mosaic of the Virgin and Child with gold gilting in dome above the mihrab ( a niche that faces Mecca). © 2012 Terry Ownby. This is a detailed view of the dome above the mihrab, which has the image of the Virgin Mary and Christ Child. This is either a fresco or a mosaic (it appears to be made of small tiles, suggesting a mosaic). © 2012 Terry Ownby. 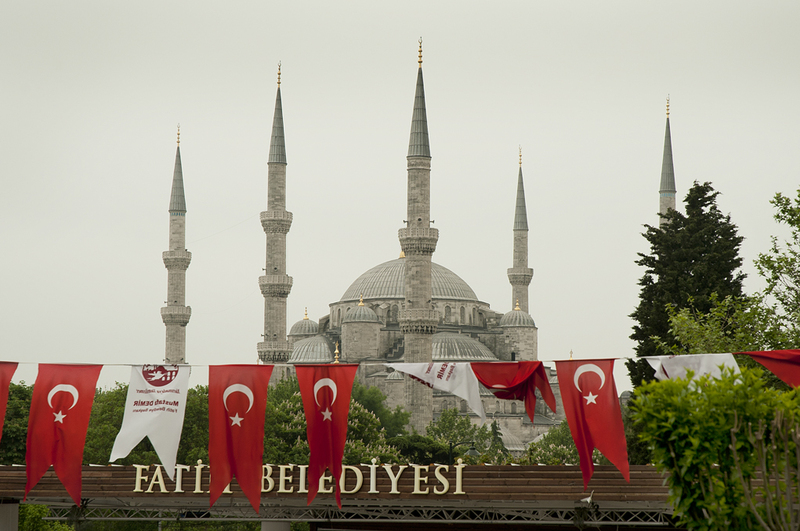 Blue Mosque (Sultan Ahment Camii) with Turkish pennants in Istanbul, Turkey. © 2012 Terry Ownby. 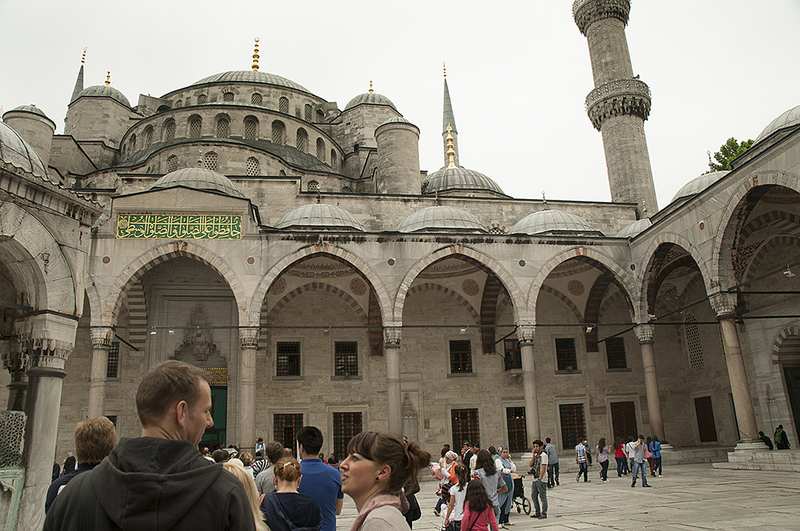 Blue Mosque courtyard with visitors qued for tour, Istanbul, Turkey. © 2012 Terry Ownby. 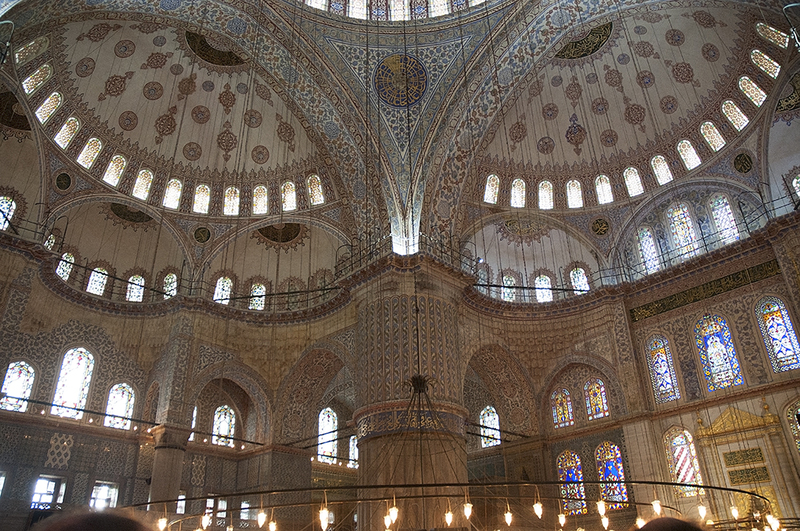 Interior view of Blue Mosque showing Iznik Turkish tilework, Istanbul, Turkey. © 2012 Terry Ownby. Blue Mosque interior view with chandelier and Iznik blue tiles. Istanbul, Turkey. © 2012 Terry Ownby. Recently I had the opportunity to present a paper on my photographic research at an international academic conference in Istanbul, Turkey. With limited amounts of free time during my short stay in this exotic and historic city, I made sure to avail myself of photographic opportunities at this ancient seaport. Formerly known as Constantinople, modern Istanbul still remains a mix of contemporary and ancient cultures. 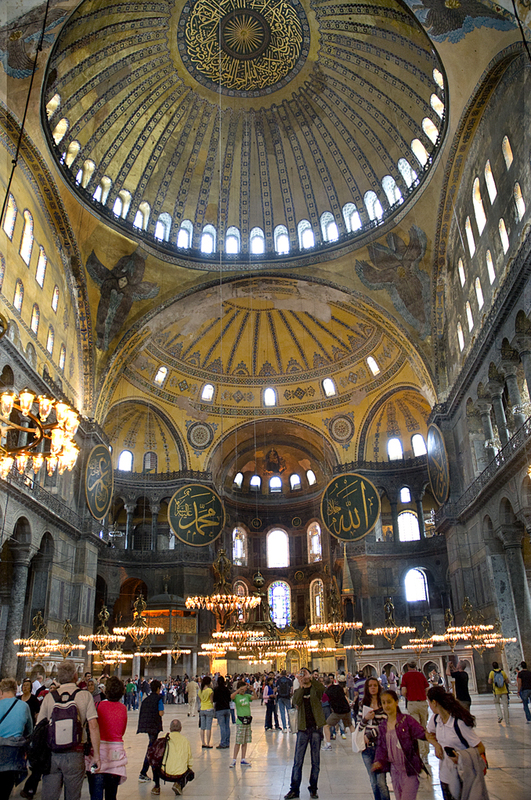 Once a major intersection of the world’s three major religious faiths (Islam, Judaism, and Christianity), Istanbul today is home to about 14 million inhabitants that mostly practice Islam. 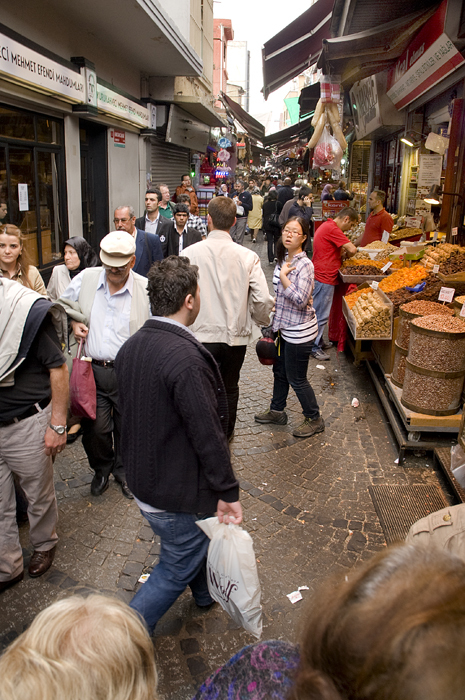 Istanbul is a cacophony of honking car horns, strange tongues, and roasting chestnuts at every street corner. 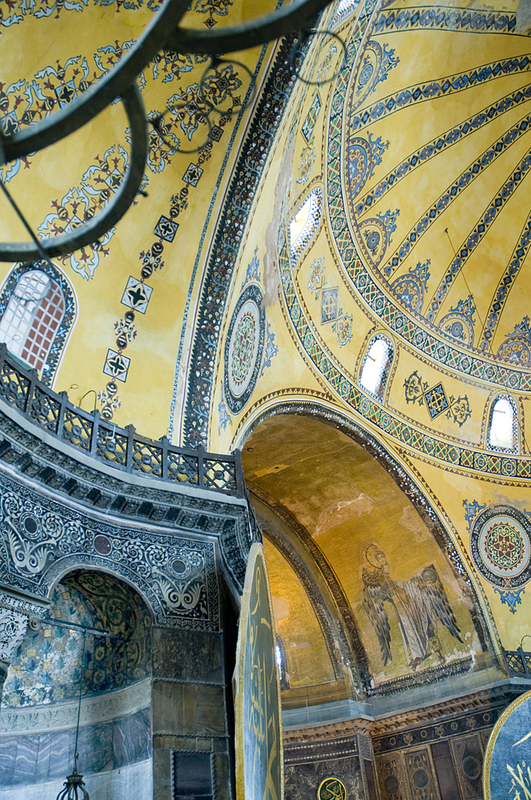 Frontal view of the Haghia Sophia, also known as the Church of St. Sophia. Presently called the Kariye Museum (Kariye is the Turkish version of the Greek word “khora”, which meant “rural area” or “country”. Located in the Sultanahmet Square, adjacent to the old city market area of istanbul, Turkey. © 2012 Terry Ownby. 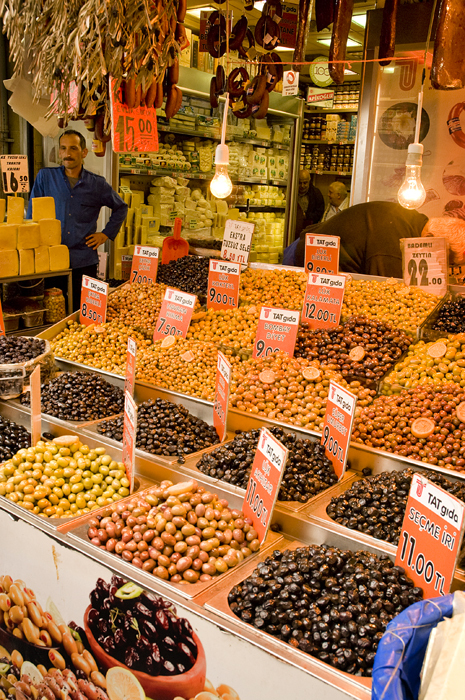 Olives, cheese, and sausage being sold at a small shop in the famous Spice Bazaar near the sea port of Eminonu, Istanbul, Turkey. This is located next to the New Mosque. © 2012 Terry Ownby. Dried fruit and nuts being sold at a small shop in one of the back alley’s of the Spice Bazaar. © 2012 Terry Ownby. 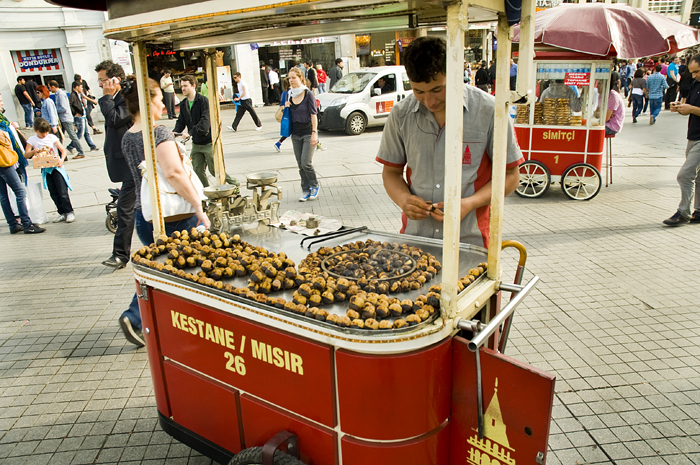 Typical street vendor in Istanbul selling roasted chestnuts (kestane). At other times, his cart is used to sell the popular snack of steamed or roasted corn-on-the-cob (misir). In background is another vendor selling the ubiqutous simit (bagel) coated in roasted sesame seeds. © 2012 Terry Ownby. 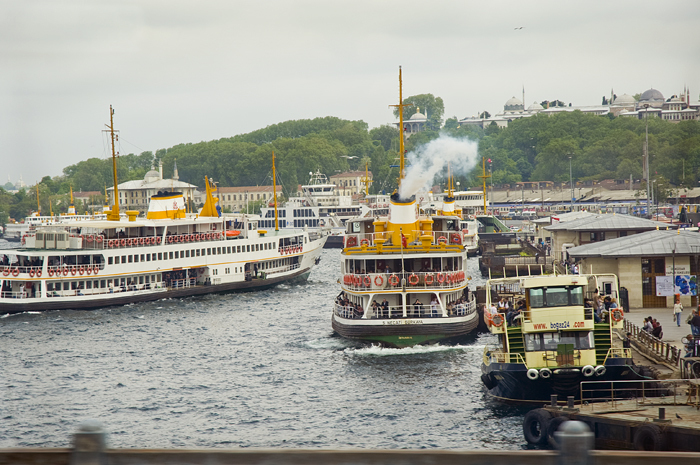 At the crowed seaport of Eminonu, passenger ferry boats arrive to disembark their human cargo, only to repeat the process across the Golden Horn and the Bosphorus Straights. On the distant hillside are the rooftops of the Topkapi Palace. Light rail trains can be seen in the background. © 2012 Terry Ownby. 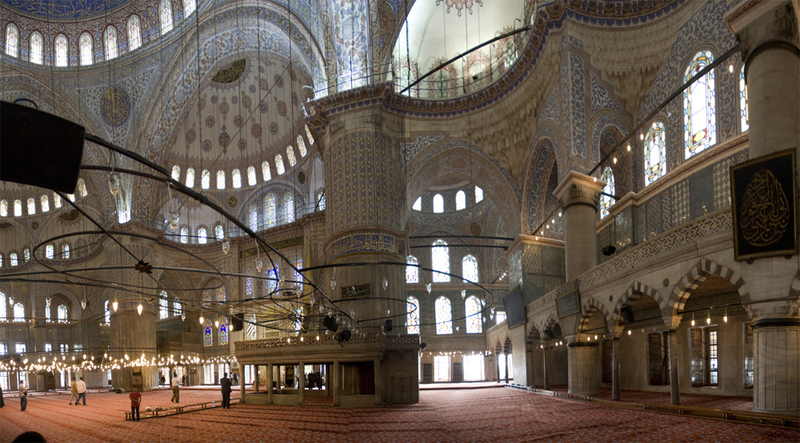 Panoramic view of the lower half of the famous Blue Mosque (Sultanahmet Camii) in the Old City section of Istanbul, Turkey. 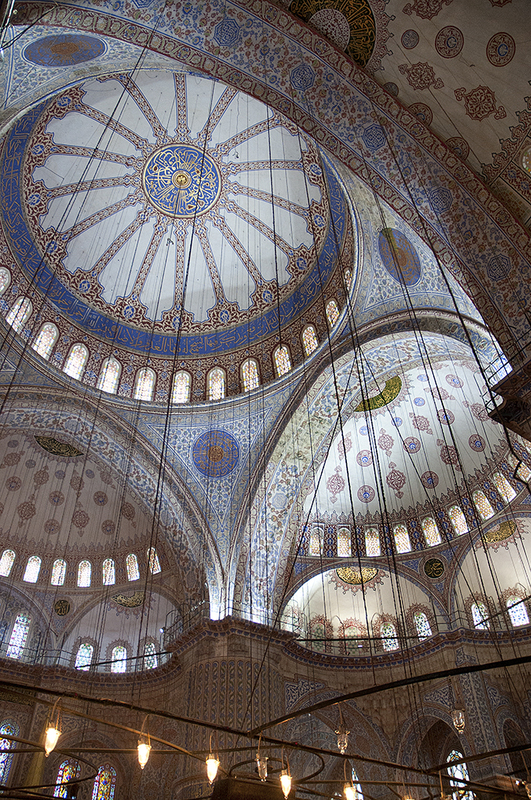 The reference to “blue” comes from the use of the blue Iznik tilework throughout the mosque’s interior. This mosque, or camii, was built between 1609 and 1616 by Sultan Ahmet I. © 2012 Terry Ownby.